Jim Lemon and I have been discussing the most effective and useful visuals to get people out and excited to look for dragonflies. Part of this discussion led to his guest post covering historical flight periods in Ohio. However, those were distribution charts combined for all species of dragonflies and damselflies. They gave you a general idea of the best time to find the most species, but not when x species might be flying. Some of the animated gifs also show the changes in the early or late season flight periods, most likely dependent on weather for that year. However, I wanted to see if we could have a standardized graph that shows quickly which groups tend to be early season versus late season fliers. 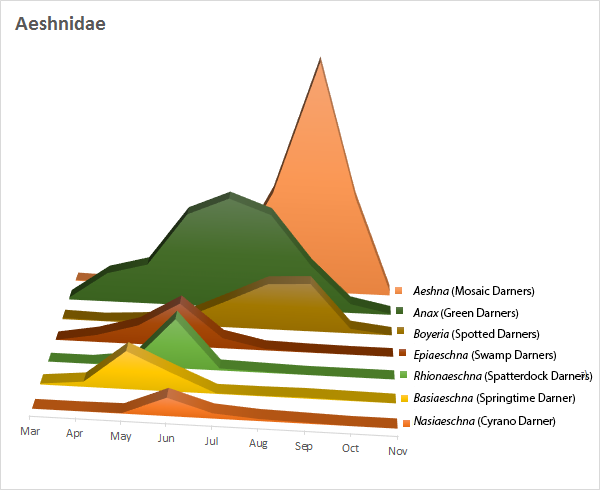 Jim Lemon worked his coding magic and was able to create the below graphs for Ohio species. I eventually want to replicate these in R using Ridgeline plots in this new Data Visualization guide (fig 7.9), but I have not had time to experiment with these yet. Below is an additional guest post by Jim Lemon. We know that individual Odonates only fly for a limited time – typically a number of days to a couple weeks. A few species can be seen flying through most of the season, and so are emerging from their wetland habitat with some regularity. As we record observations, these species data can be counted and plotted against date – and compared to others. Taking the data for specific groups – Damselflies (Zygoptera), Darners (Aeshnidae), and Skimmers (Libellulidae) – we can plot their flight frequency to see the differences. Here you can see the average flight period of various damselflies. If we group by genus and order by increasing numbers we can see the relative flights. Auroras, Sprites, and Red Damsels with relatively low numbers, and peaking early. Jewelwings also peaking relatively early, but in greater numbers. Rubyspots and Spreadwings coming on a little later. Forktails showing their season long records. Finally big numbers for our Bluets and Dancers. We can also look at individual species of Bluets (Enallagma spp.) to see that there are several species that are mainly found in June (Boreal, Northern, Hagen’s, and Marsh) that are not documented later in the season. We would note that these taxa are also particularly challenging to identify and a good side profile shot of the terminal appendages is needed to differentiate them by photo. In a similar treatment for the Darners, grouped by genus, we see some flight differences. Again, an early flight for Springtime, Cyrano, Spatterdock, and Swamp. Pretty much full season flight for the Green Darners. Then a late flight for the Spotted and Mosaics, with big numbers for the Mosaic Darners. 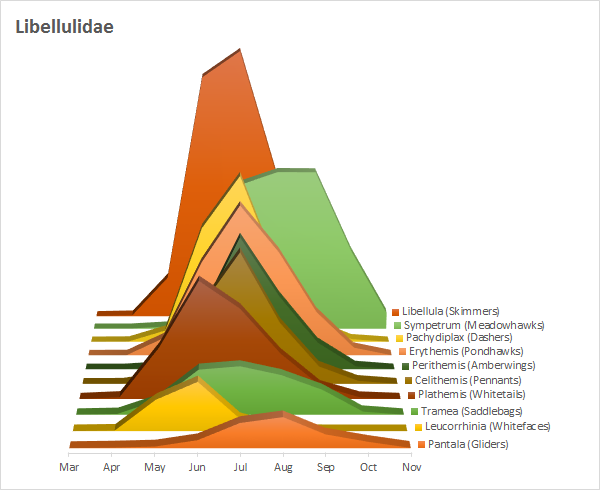 The family Libellulidae is a varied group, but we can at least make a flight distribution chart for most of the genera. The Skimmers are our best represented group in terms of numbers. As a group, they are more consistent – with strong peaks in early-to-mid July. The exceptions on the early side are Whitefaces and Whitetails, on the late side with Meadowhawks and Gliders. 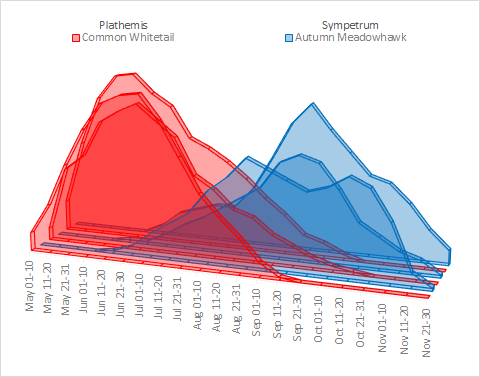 If we take two species, Common Whitetail and Autumn Meadowhawk, and segment the data by an arbritrary time period (early years, mid years, recent years) we can get a different view. Here, we see the early flight of the Common Whitetail and the late flight of the Autumn Meadowhawk. And while there is some variation from period to period, these flight patterns are consistent across years. 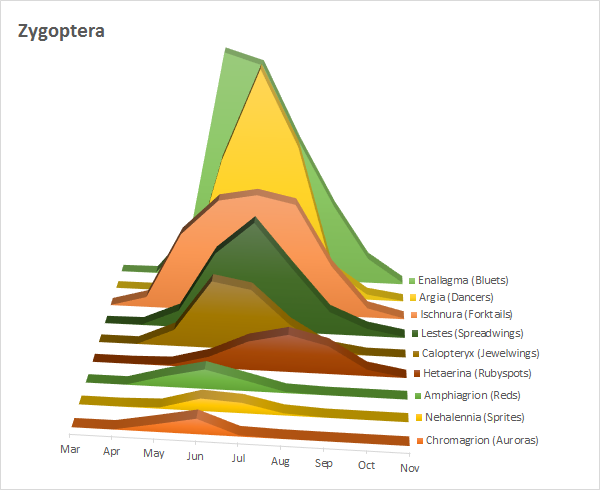 Distribution charts made with data from the Ohio Odonata Society database current as of December 2017. Flight periods reference Ohio flight dates, so expect variation depending on your latitude. 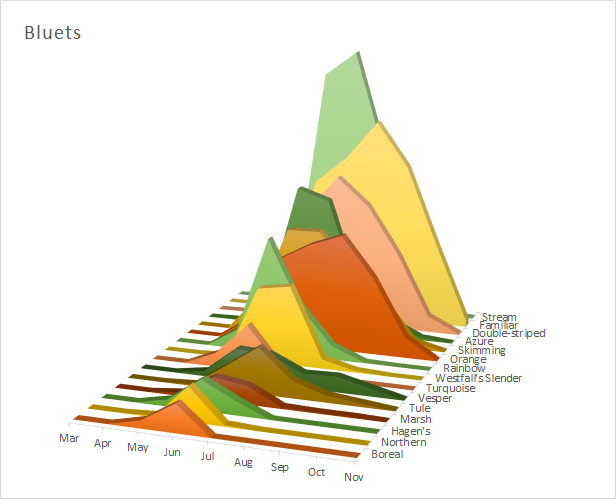 So cool to see the data reflected in the charts! Really nice work, Jim. Great job, MaLisa and Jim. These are awesome charts and I think the visuals could really be helpful in getting people interested and highlighting odonate diversity. Great job! I will definitely use the new charts! The flight sheet is a added bonus!